Functional Medicine is patient-centered healing at its best. The axiom is treat the person not the disease. The approach is treat individuals who may have bodily symptoms, imbalances and dysfunctions. 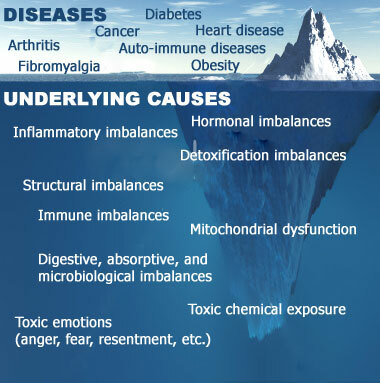 As the graphic of an iceberg to the left shows, named diseases such as diabetes, arthritis, fibromyalgia, or autoimmune processes lie above the surface, but according to Functional Medicine, the causes lie under the surface as altered physiology. Almost always, the cause of the disease and its symptoms is an underlying dysfunction and/or an imbalance of bodily systems. Health is defined as optimum function, and therefore the approach would be to identify the malfunction(s) and influence the physiology back to better function as opposed to treating the symptom or disease. If mainstream health care treats just the tip of the iceberg, it rarely leads to long-term relief and vibrancy. Identifying and treating the underlying root cause or causes, as Functional Medicine does, has a much better chance to successfully resolve a patient’s health challenge. Today’s health care system is in trouble because it applies a medical management model that works well for acute health problems to chronic health problems, where it is much less successful. If you have a heart attack, accident or sudden lung infection such as pneumonia, you certainly want a quick-thinking doctor to use all the quick-acting resources of modern medicine, such as life-saving technology, surgery and antibiotics. We are all grateful about such interventions. For treatment, Functional Medicine practitioners use a combination of natural agents (supplements, herbs, nutraceuticals and homeopathics), nutritional and lifestyle changes, and spiritual/emotional counseling, to prod a patient’s physiology back to an optimal state. In addition, educating the patient about their condition empowers them to take charge of their own health, ultimately leading to greater success in treatment. Functional Medicine approaches health problems differently. Instead of masking the problem, it aims at restoring the body’s natural functioning. • Biochemical individuality describes the importance of individual variations in metabolic function that derive from genetic and environmental differences among individuals. • Dynamic balance of internal and external factors. • Web-like interconnections of physiological factors – an abundance of research now supports the view that the human body functions as an orchestrated network of interconnected systems, rather than individual systems functioning autonomously and without effect on each other. For example, we now know that immunological dysfunctions can promote cardiovascular disease, that dietary imbalances can cause hormonal disturbances, and that environmental exposures can precipitate neurologic syndromes such as Parkinson’s disease. • Health as a positive vitality – not merely the absence of disease. • Structural imbalances from cellular membrane function to the musculoskeletal system Imbalances such as these are the precursors to the signs and symptoms by which we detect and label (diagnose) organ system disease. Improving balance – in the patient’s environmental inputs and in the body’s fundamental physiological processes – is the precursor to restoring health and it involves much more than treating the symptoms. Functional medicine is dedicated to improving the management of complex, chronic disease by intervening at multiple levels to address these core clinical imbalances and to restore each patient’s functionality and health. Functional medicine is not a unique and separate body of knowledge. It is grounded in scientific principles and information widely available in medicine today, combining research from various disciplines into highly detailed yet clinically relevant models of disease pathogenesis and effective clinical management. Functional medicine emphasizes a definable and teachable process of integrating multiple knowledge bases within a pragmatic intellectual matrix that focuses on functionality at many levels, rather than a single treatment for a single diagnosis. Functional medicine uses the patient’s story as a key tool for integrating diagnosis, signs and symptoms, and evidence of clinical imbalances into a comprehensive approach to improve both the patient’s environmental inputs and his or her physiological function. It is a clinician’s discipline, and it directly addresses the need to transform the practice of primary care. Copyright 2012 DrDavidSchiller.com All Rights Reserved.